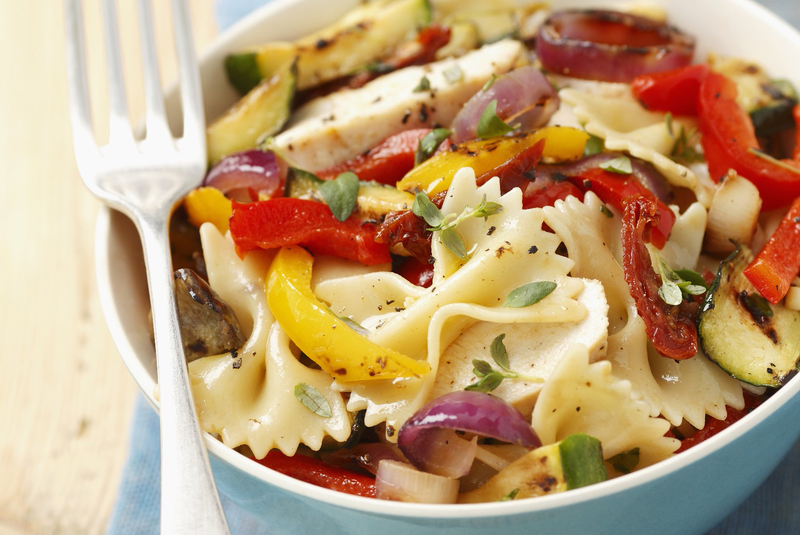 Our Chicken and Grilled Vegetable Pasta Salad is the perfect salad to make in the summer to make use of all the seasonal garden-fresh veggies. Grill peppers, zucchini and red onions on the barbecue, then toss with penne pasta and a splash of Tuscan dressing. Toss peppers, zucchini and red onions with 1/4 cup dressing. Grill 12 min. or until crisp-tender, turning occasionally. Cool. Meanwhile, cook pasta as directed on package, omitting salt; drain. Rinse with cold water; drain well. Place in large bowl. Cut grilled vegetables into 1/2-inch pieces. Add to pasta along with the chicken and remaining dressing; mix lightly. Sprinkle with green onions. Add 1 chopped jalapeño pepper to salad along with the chicken and remaining dressing. Vegetables can be grilled ahead of time. Cool, then refrigerate up to 24 hours. Remove from refrigerator and let stand at room temperature 30 min. before using as directed.